In 2015, UCLA’s Institute of the Environment and Sustainability issued the nation’s first environmental report card for a major metropolitan area. 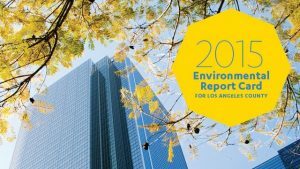 The purpose of the 2015 Report Card was to establish a baseline from which to measure the County’s progress toward environmental sustainability, and to create a thought-provoking tool to catalyze discussions and policy changes that would contribute to a healthier environment for Los Angeles County. 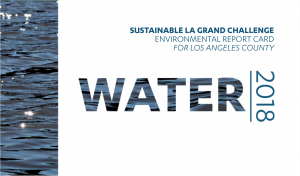 The Sustainable LA Grand Challenge provided a natural opportunity to align the Report Card with Sustainable LA’s specific goals to transition LA County to 100% renewable energy, 100% locally-sourced water, and enhanced ecosystem and human health by 2050. 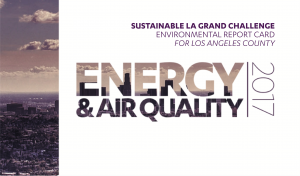 Starting in 2017, the Sustainable LA Environmental Report Cards will be released bi-annually, with a focus on one of three major areas: Energy & Air Quality, Water, and Ecosystem Health. Associated human health indicators will be included within each Report Card, and a summary Report Card that highlights major accomplishments and important current environmental topics will be published biennially.